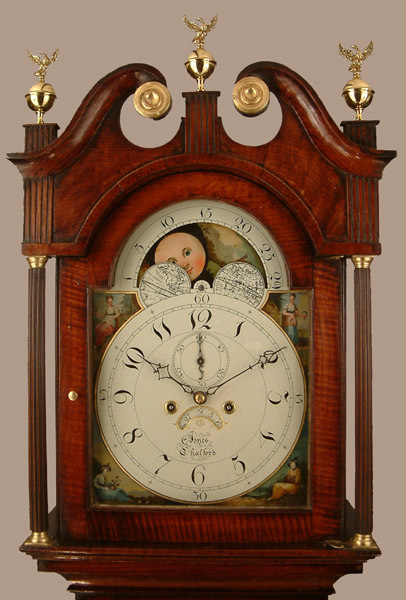 Jones of Chalford Longcase Oak Circa 1808 - Height 91.7in. This Longcase Oak Archive's Maker - Jones of Chalford. This would have been Daniel, married 1st June 1801 "a bachelor 30 and upwards" to Hannah Elborough, "spinster aged 26 and upwards".They had three chidren ( at least ) Mary, born 1805,Hannah, born 1807, and Joseph Elborough born 1810.Daniel Jones of Chalford is recorded circa 1801 - 1840. A good, well proportioned, "country" plain oak case with reeded hood columns. The swan neck pediment surmounted by three eagle ball finials. 12" breakarch painted "Wilson" dial with moonphases to arch, subsidiary seconds dial, "sad mouth" date aperture, wavy Arabic numerals and colourful four seasons spandrels.Blued cut steel hands. N.B. 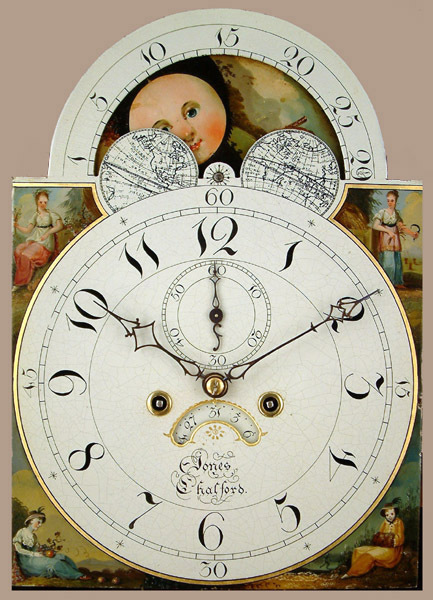 James Wilson, the famous and well respected dial maker was working from 1780 under his own name until 1808.He died 3rd April 1809.He was previously in partnership with Thomas Hadley Osborne 1772 - 1777 the partnership being the first to produce painted dials. Good quality 8 day movement with 4 knopped pillars.Hourly ( rack ) striking on a single bell. Jones of Chalford. This would have been Daniel, married 1st June 1801 "a bachelor 30 and upwards" to Hannah Elborough, "spinster aged 26 and upwards".They had three chidren ( at least ) Mary, born 1805,Hannah, born 1807, and Joseph Elborough born 1810.Daniel Jones of Chalford is recorded circa 1801 - 1840. 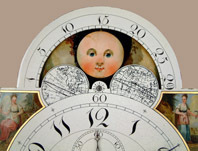 Dating by style and bearing in mind that the dial maker James Wilson died in 1809, circa 1808. 91.7" ( 233 cms. ) or 88.5" ( 225 cms. ) ex. finials.